Come and celebrate Holy Week and the Joy of Easter Morning! Anyone interested in helping spruce up the grounds at Our Savior, inside and outside, is welcome to help! Pizza will be served for lunch. The final Lenten Soup Supper will be held on Wednesday April 10th. Come as you are and join us! We will begin in the Fellowship Hall at 6:00 p.m. with a soup dinner, and worship in the Sanctuary at 7:30 p.m.
Join us, for some fun fellowship! It is an easy to learn, easy to play dice game that takes no skill to play. (Anyone can do it!!!) People sit in groups of four and after each round, some of the players switch tables. It is a great way for our OSLC adults to socialize and get to know one another better. We would love to have appetizers and desserts. To volunteer to bring an appetizer or dessert to share, please let Heather Fredericksen know. You won’t want to miss this fun evening. There will be prizes for the winners!!! PLEASE SIGN UP ON THE POSTER FOUND ON THE BULLETIN BOARD BY THE FELLOWSHIP HALL DOORS. Dinner Out at Chipotle February 19th, 4:00 -8:00 p.m.
Chipotle located at 1002 S. Glebe Road in Arlington. 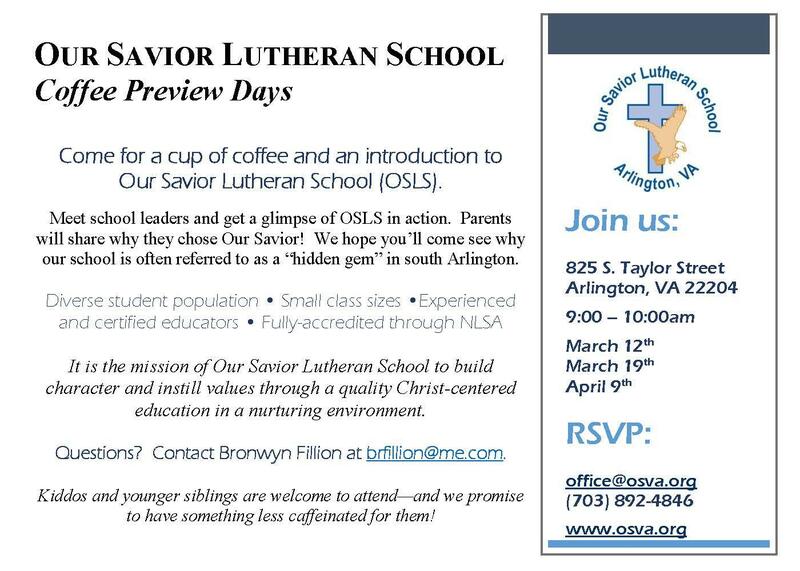 Please join us and show your support for Our Savior Lutheran School. 33% of the proceeds will come back to the school! TIARAS AND TIES ~ "FATHER – DAUGHTER” DANCE February 8th from 7:00-8:30 p.m.
$10 per person, Semi-Formal attire optional, all ages welcome. Tickets will be available at the door, or you may purchase them in the church office during the week.